It’s almost time to hit the (mom scheduled) books again! That means it’s time for us to start our formal academic school year. We start school next week! Wahoo! Why so early? Well, because we take a two week vacation in September-October and we like to end school by mid-May. That puts us starting… this week. Ha! But my sister wanted to come visit this week and there was no a chance I was saying no to that. So, we will play, visit, camp, and more. So we will start school next week. Should be Monday, but there is an inclusive fishing trip hosted by the Center for Development and Disability Autism Unit that day amd we are participating, so Tuesday it is! Wahoo! Anyway, in celebration …. 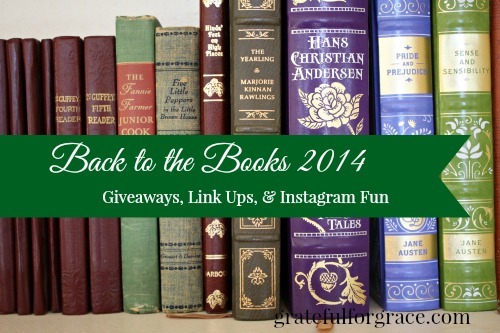 I’m hosting a Back to the Books Event! There will be link ups every week and giveaways every week. Yup, seriously. The giveaways are surprises for y’all, but I’m sharing the link ups so you can prepare. I’d love for you to participate via your blog or by joining in on the fun on Instagram and Facebook. How do you enter the giveaway? Click the Rafflecopter entries for each post. 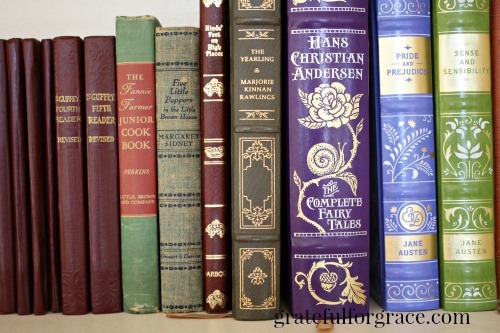 Link up a post about books you love to read with your children. Link up a post about a book that rocked your world, inspiring you to be a better woman or the grace filled woman you were designed to be. Link up a post sharing about ways that you pamper yourself, so that you are refreshed and not weary. Alrighty, let’s have some fun together as we start hitting the books, homeschooling or not. I look forward to your photos on Instagram (follow me at gratefulforgrace) or Facebook! Little glimpses into your lives and into mine. I also look forward to encouraging you as you hit the books, since it can sometimes be a bumpy start. Honestly, I’m relieved we are starting formal academics, aka: school, again because I need the break from our crazy summer schedule. Let’s have fun going back to the books! How about you? Are you glad school is starting?